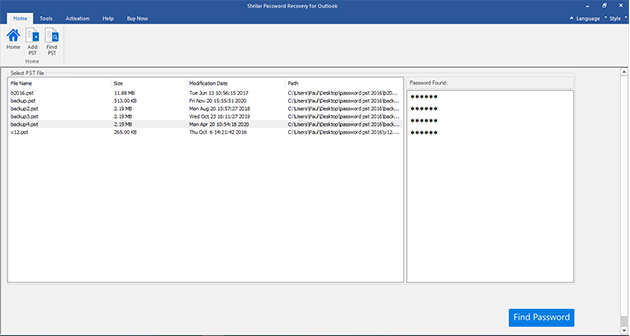 The software recovers Outlook PST passwords, which are forgotten or lost. The software scans the PST file and suggests a set of passwords that can be used to open that PST file. 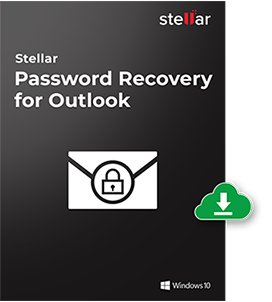 Stellar Outlook Password Recovery scans the locked PST file and generates a set of six different passwords to open the particular PST file. The software lists all the PST files in the system hard drive, from which you can choose the needed PST file and perform the PST password recovery operation. This feature is useful, if in case you do not know the exact location of the required PST file. The software has been designed with powerful scanning algorithms and recovers the most complex passwords, even with lots of special characters. The software allows you to copy all the recovered passwords and save them in a Text file for further use. The 'Update Wizard' in the software interface provides information about the latest available updates for the software and you do not need to browse through Internet for it. 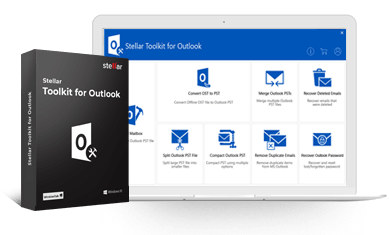 The software has been developed with highly interactive and simple user interfaces, which helps even the novice users to recover Outlook password without any further assistance. 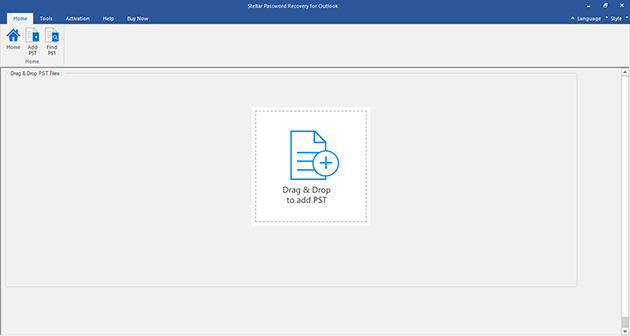 MS Outlook 2016, 2013, 2010, 2007, 2003, 2002 and 2000. The software is compatible with all major Windows operating system, including Windows 10, Windows 8.1, Windows 8, Windows 7 and Windows Vista. 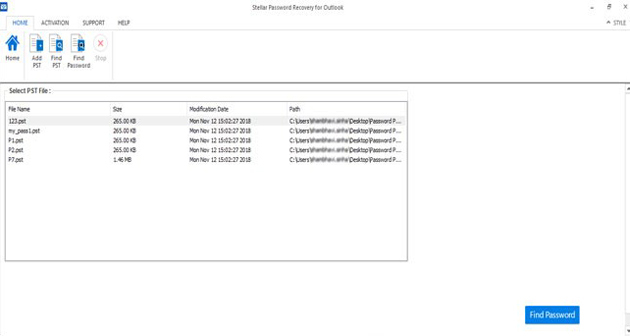 It is the main interface of Stellar Password Recovery for Outlook. 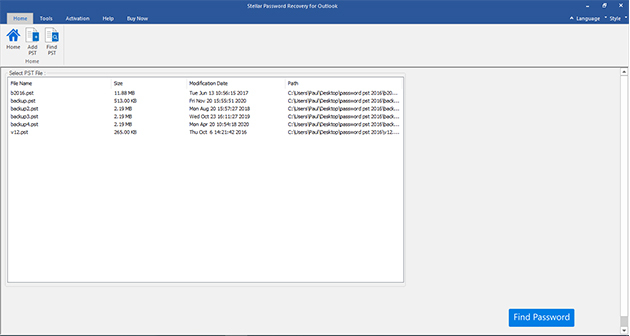 From the 'Home' menu, you have three options (Drag and Drop, Add PST and Find PST) to locate PST file. In 'Find PST' option, you can find PST files in any folder, subfolder or an entire drive in your system. Now, you can check the list of all available PST files. Then, a user can select the desired file for the password recovery process. Click on the 'Find Password', and then a series of passwords will be generated which can be used to open your password protected Outlook PST file. Que: Will the software generate the same password which I have set and forgot or it will generate a different one?